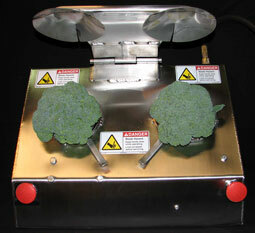 Easy to operate and very reliable, the air-driven Broccoli Floret Machine is 2 to 4 times faster than manual cutting. 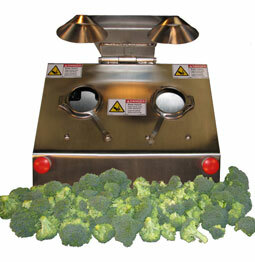 Simply load two heads of broccoli into the machine slots and push the buttons. The machine does the rest, removing unwanted stems and cutting the head into perfect florets. 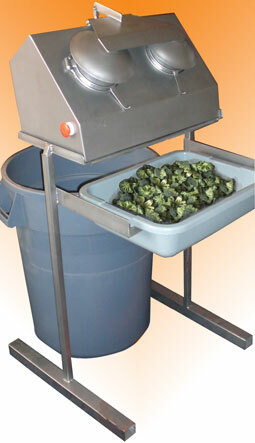 The air-driven Broccoli Floret Machine is designed so the user has to use both hands to load the broccoli heads and then must use both hands to active the machine. Florets drop into a tote or conveyor. One person on the production line can manually cut approximately 10 heads of broccoli per minute while the dual head air-driven Broccoli Floret Machine can cut approximately 40 heads per minute. ASK ABOUT OUR single-head air-driven Broccoli Floret Machine - which will still produce twice as much as manual production.